Turtle Talks | Episode #6: Is Money Energy? Monica: Hi, I’m Monica Laurence, creator and host of Turtle Talks. Today we’re talking with Alnoor Ladha, co-founder of TheRules.org. We’re catching Alnoor in South Africa. Alnoor, welcome to Turtle Talks. Alnoor: Thank you for having me. Monica: Maybe you could give us little bit about your background. Alnoor: Sure. I’m part of an organization called The Rules, which is a network of activists, organizers, writers, researchers, coders dedicated to addressing the root causes of both inequality and poverty. And we work with social movements from around the world and try to get more radical thoughts into the mainstream, alternatives to our current economic operating system. Monica: How did you become interested in this particular topic? Alnoor: I started in some ways in the climate movement and just interested in what was happening to nature. That was really my entry point. I was born and grew up in Vancouver, Canada, which is this beautiful city that’s really nestled in wildlife, in nature. And understanding species extinction for the first time when I was like seven or eight, it captured me. And I knew that this is the thing I have to work on. But it was really actually Seattle, 1999, the WTO protests that really opened my eyes to the broader gaze. I realized that climate change is not man-made in a traditional sense how we think of it. It’s actually capital-made. Every dollar of wealth created heats up our planet. And if I didn’t really understand the structure of the global operating system, I could know all the climate science in the world, and it wouldn’t matter. And that was really a formative point for me in my journey. Monica: Well, that’s fascinating. How is it that every dollar of wealth created heats up the planet? Alnoor: Well, we basically have a fossil fuel extractives-based economy. And so there’s almost nothing in our supply chain that doesn’t rely on fossil fuels. And it actually doesn’t have to be that way. But in many ways, the national interests of major governments are totally aligned with the fossil fuel extractives industry. And so just one example is Exxon. Last year, Exxon made more money than any company in the history of profit, in the history of capitalism. And I think they made about $40 billion in profit. And they still got a $2 billion subsidy from the U.S. government. That’s taxpayer money that’s going to the richest corporation, one of the richest corporations in the world. And it’s not going to their clean energy discovery projects. So not only does every dollar of wealth created heat up our planet, globally 93 to 95 cents of every dollar of wealth created ends up in the hands of the top 1% as wealth dividend. And so every dollar of wealth created essentially creates inequality by definition and heats up our planet. Monica: So we’re in a cycle in which the more wealth we produce, the greater the differential in wealth and poverty on the planet. Can you help us understand in a simple way what’s going on with this monetary cycle? Alnoor: Yeah, I think here’s the simplest way to think about it. So we have a debt-based monetary system, which is, of course, a man-made construct, right? And that debt-based system is determined by interest and, again, which is just a man-made construct. And so what happens in a debt-based system is that growth has to exceed interest for that money to be valuable, right? Economics 101. So you want the overall economy growing faster than people’s ability to pay that money back so they can actually pay that money back. And so what ends up happening is we have to grow every year at roughly 3%. So we just did that last year in 2014. So global GDP was $62 trillion, right? Big number. And to grow the economy, at 3% on that number, we grew the economy by $2.2 trillion. Now, that doesn’t sound like a lot in some ways when all these big numbers and they’re relative. But just to put that in perspective, $2.2 trillion was global GDP in 1970. So we went from the dawn of civilization to 1970 to get to $2.2 trillion in GDP. And now we need that number just in the delta. So that is the nature of the debt-based system. And there’s a whole bunch of assumptions that are rooted within that. And of course, the key one is how we measure growth. And for technocrats, progress is GDP, and how we measure our wealth is GDP growth, which is disregarded by even mainstream economists for 10 to 20 years and more fringe progressive economists for 30, 40 years. And it’s a crazy measure, right? And we all know why, and we’ve heard all the critiques of why simply looking at GDP isn’t progress. But when you do measure GDP as the only thing, all that matters is GDP growth. So we’re measuring the wrong thing, and we’ve actually created the wrong system that’s underpinning our entire global economic operating system. We’ve created a situation where we’re now mitigating for three to four rise in temperature in our climate where 250 species a day are going extinct because of our economic industrial activity and where the boom bust cycles of capitalism are getting faster and faster and more intense and more intense. And so I think the writing is on the wall. There’s no doubt about it. Whether that happens economically or that happens through the natural limits of this planet, we probably have 20 to 30 years of the Western way of living left. And so I think we have no other option but to figure out how we create that transition in a way that’s sustainable, in a way that’s equitable, in a way that creates the least amount of trauma for our species and other species. Monica: Relating this into the Turtle Talks episode, Alnoor, in your work, do you consider money to be a form of energy? Alnoor: I think in some ways that there is this basic argument, and one of the people on the Turtle Talks panel said the same, which is it’s a benign tool in some ways. But I don’t think it is. Just like I don’t think a gun is just a gun. It has an intention. It has a creation and especially money in the modern form, of course, it’s charged. 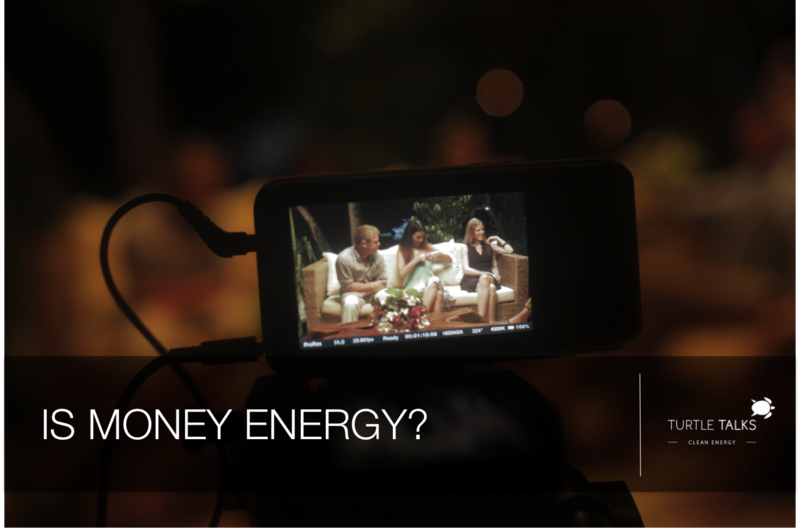 And theoretically, money can be energy, and just a tool and this sort of benign thing. But money in the modern sense is debt-based currency, and debt-based currency, as we know, skews towards climate destruction. It skews towards infinite growth. It skews towards inequality. Therefore, it is energy, but a very negative form of energy. There’s all this research that has been coming out in the last 10 years about energetically also what money does to you. One simple example is the screensaver studies where they’ll have a control group, that essentially has their screensaver replaced with money signs. And then there’s the random group that just has smiley faces or “LOL Cats” or whatever you have. And what ends up happening is just the priming of that dollar sign, when you’re called to do an altruistic act and very simple things, sometimes they just drop a pencil in front of the person’s desk. The chance of you picking up that pencil is under 10% when you’re primed by a money sign. And that the chance of you picking up that pencil when you have some benign screensavers in the 90s or whatever. And what’s interesting about that is that what it’s essentially saying is that what the idea of money does is it sort of triggers a fight or flight sort of response. And it basically taps us into our lizard brain. Because in order to get anywhere, to do anything, etc. etc. in society, in our modern society, you’re attached to money. You have to have it. We work in order to have it. Most people are in some form of debt slavery, earning money just to be able to access basic things. Most people are going into debt for healthcare or education, the most basic of human rights. And so, I think money is energy. In the modern sense it is a highly corrosive energy that one of the things if we want to address all these pressing problems, we have to address is the debt-based currency that is the sort of mold of the current. It’s basically the charge of the energy, if you will. Does that make sense? Monica: We develop a relationship with money that causes anxiety? Would that be a simple way to put it? Alnoor: Yeah, I think it has its personal implications which is like fear the need for security in some senses, greed and selfishness at the personal level. And then I think at the societal level what it creates is the need for infinite growth, the need to sort of carve up the pie and then, of course, all the externalities the biggest thing being climate. And so there’s like a personal level, there’s a societal level, and there’s an ecological level, and it’s charged in all three of those realms. Monica: So Alnoor, do you have a vision of what this economic future looks like? Alnoor: In many ways, I think that that’s impossible, and none of us know. But what we could do is agree on the principles of a world we want to see. And even right now, let’s do an exercise, right? Let’s close our eyes. And visualize the world as we would want to see it in 20 years in a very detailed way. So what is our economic arrangement? How do we educate our children? What does our healthcare system look like? What does our food distribution system look like? What does our social infrastructure look like? When you ask people this question and we do this exercise, what we find is that if you ask a hundred people, there aren’t a hundred different perspectives. We broadly are aligned on what a fair, just outcome for society is, right? John Rawls, the famous political philosopher had this idea of the veil of ignorance, right? If we’re going to construct the ideal society, let’s assume a veil of ignorance where we don’t know what our role will be when we’re deciding on the rules. So we could come back as a janitor, or we could come back as a CEO. And that’s the ideal way to construct society. And it’s interesting that people, when you ask them to create their own vision, do create a more egalitarian, a more communitarian world. And that’s because all the science we’re learning from behavioral economics, from evolutionary biology is that we’re hardwired for fairness. We’re hardwired in some ways for equality. We’re hardwired for empathy. And so I think there’s going to be many different expressions of what the ideal post-capitalist world looks like. And the values that are shared, for me at least, there’s a very strong local economy that the role of work, for example, is not just job creation or to increase GDP, but to increase that sense of community. And not to say there won’t be any business. Of course, you can’t be against markets and trading. That’s natural to human exchange. But they will be cooperatively owned. They will be localized. The role of government is not to essentially create some small power elite that makes decisions on our behalf but essentially decentralizes that power and localizes that power. And so I see more of a deliberative democracy in a political sense. I see relocalization in an economic sense. And I see a more symbiotic relationship between humans and the biosphere and Mother Earth. Monica: Are we in a position to accelerate towards a future that is more community-based, more equitable, more in line with living in harmony on the planet in conjunction with Mother Earth? Is there a way that we can accelerate that? Or are we along for the ride, and the current systems will likely transition in and of themselves? Alnoor: At the highest level, what we need is essentially a values revolution. And it’s happening around the world. There is a shift in consciousness that’s happening. There’s going to be more of a spiritual enlightenment and an understanding that we all have a responsibility. The blame is not just on those who are in power, who are making these decisions and rules. It’s also on the rest of us for co-manifesting this reality. And that part of the process of awareness of our surroundings and reintegrating our relationship with nature is going to be a more holistic worldview. But I don’t see it happening immediately. And unfortunately, I think that a serious trigger like a climate crisis is going to be inevitable in order to redirect the energy of human beings. We’re highly adaptive, but we’re also highly reactionary. Monica: As the mass majority of people on the planet, how do we think about this? How do we live our lives in a way that doesn’t trigger fear, where we can live our lives in a way that is more productive and community-conscious? Alnoor: I think, for me, one of the starting points is that we have to be in total acceptance of what is and have faith in the sense . . . and I think part of what the climate crisis is going to do is to help us tap back into that, because there is going to be fear, and there is going to be anxiety. And the response is not “Well, I don’t want to have any fear or any anxiety or any stress about what’s happening.” The Western reaction especially is that “I only want to know the good news. And I only want to stay in an optimistic mindset.” And that mindset I think comes from a position of huge privilege. That is not the way the majority of the world lives their lives, right? Fear and stress are a natural part of the human condition. And so the question for us is, how do we use the necessary angst, the fact that we are destroying the planet at a rate right now that’s a thousand times the baseline rate of extinction? We’re in the sixth great extinction, and it’s Anthropocentric. It’s human induced, right? And be in total acceptance of that and what is and actually use these natural feelings to help transform us and to spiritually evolve us, because that’s the world we’re facing. And this is the reality we’re facing. And this moment could really be a trigger to . . . almost like a rite of passage, an initiation for humanity in some ways to enter its next phase of consciousness. I’ll just give you three great examples that we see bubbling up that give potential for hope, actually four. Just push it a bit, you know. One is that the rise of alternative communities, and we’re seeing this in the transition towns in the U.K., all forms of intentional communities. There’s an amazing place in India called Auroville that was started in the 1960s and 1970s, based on Sri Aurobindo’s philosophy. And many of these, like Tamara in Portugal, Damanhur in Italy, and even Findhorn in Scotland, which is one of the famous original ones in the west, are operating on a system of no debt-based currency at their core. Their design and architectural principles are based on bio-mimicry, bio-philia and being in symbiosis with nature. So I think that rise of almost like the infrastructure for transition is one really interesting hopeful set of alternatives. Another is this, which is it’s not an immediate thing, but is this idea of demurrage currency, that was originally proposed in the early 1900s in Germany. There’s been German towns and Austrian towns throughout history that have actually brought this currency into full flow. But it’s essentially negative interest. And so, like all natural goods and services and stock, they depreciate. And so like cattle or grain, they would pick an arbitrary number, let’s say 1% a quarter, and the money would depreciate. And what it does is that it incentivizes generosity and non-hoarding, and so people know that their money is going to decrease rather than increase, and it creates this share and flow of income, which I think is hugely powerful and one of the solutions and part of the package in this idea of steady-state economics and degrowth economics that needs to be ushered in. A third is what people are calling citizens income, which is this idea that everybody, every citizen, gets a minimum income. Let’s just say it’s around $30,000 USD in an American context. And what that does is it frees people from having to work for the sake of working which, of course, creates all this unnecessary GDP and growth, etc. And it gives people the creative freedom to actually be innovators. So that’s the third major reason to be hopeful, and I think the fourth and the most immediate in many ways, is the idea of regenerative farming, and all the research we’re getting around regenerative farming. So by regenerative farming, I’m talking about organics, smallholder farming, there’s sort of certain methods related to it, but I won’t get into the detail of it. But basically the upshot is that we’ve found that this type of farming, which is hugely widespread, you know, about 70% of the world’s food comes from smallholder farmers, and almost half of those farmers are already doing comparable methods of farming. This type of farming sequesters huge amounts of carbon. Monica: Alnoor, what practices do you have that have expanded your consciousness? Alnoor: Well, I think a combination of things. I think just basic mindfulness and the Goethe method of spending time in nature and trying to reconnect. Growing up in cities, as now over 50% of us do, disconnects you from the natural source, and that disconnection leads to a whole set of other issues. And I think that the current crisis we’re facing is not just an ecological crisis or an economic crisis. It’s a spiritual crisis. And one of the major roots of that spiritual crisis is our disconnection from nature. And so that to me is a key practice. Another is meditation and just going within both morning and night. Sometimes, it’s as short as five minutes, or it’s half an hour, or it’s an hour, but some deep reflective practice. For me, meditation is setting my intention for my day, my life, the way I walk, but also for the world I want to see. And then it’s also the silence, the awareness, the receiving. And the two go together like an inhale and an exhale. Monica: Alnoor, as you project forward and think about your life and the opportunity to look back over your life, what is it that you would like to say you’ve accomplished? What would be your legacy? Alnoor: In many ways, I feel the idea of legacy is antithetical to my work and the type of work I want to do in the world. And so I don’t really think about legacy. I just think about, with the endowments I have, with the luck and privilege I have, did I contribute in the most useful way or not? And even then, this idea of most useful or most effective, that can be somehow measured. It’s like, did I really listen to my heart’s calling? And did I contribute in the places where I felt that I should have contributed? And to me, that’s more important than legacy. I also come from more of a mystical worldview in that I believe that every act is cosmic act. And as a result, every person has the potential to contribute in ways we don’t even know and we don’t even understand. Every individual plays this important role that unfolds the drama of the cosmos in all these ways. I think what drives me as a result, it’s something completely different, which is an integrity to myself, to my ancestors, to a spiritual path that I have chosen for myself, in a disintermediated way, with no expectation of reward but also no expectation of glory and also no desire for any of those things. And that’s just my approach. And people may disagree with that. And they would say to me, “Well, if everybody believed that, that could be disempowering.” Well, that may be true. For me, that’s the most empowering thing because I know the will and the propelling force is not external. It’s internal, which to me is much more powerful and much more motivating. Monica: Thank you so very much for joining us. It’s been absolutely a delight and pleasure to learn from you and to look at a vision of our monetary future through your eyes. Alnoor: Thank you. Thanks for having me, Monica. About Alnoor Ladha: Alnoor is a writer, poet, activist. Alnoor’s work focuses on the intersection of political organizing, storytelling and technology. He is a founding member and the Executive Director of /The Rules (/TR), a collective of activists and organizers focused on mobilizing citizens in the Global South to address the root causes of inequality and poverty (e.g. land rights, trade policy, tax justice) rather than simply focusing on aid. Alnoor is a writer and speaker on new forms of activism, the structural causes of inequality, the link between climate change and poverty, and the rise of the Global South as a powerful organizing force in the transition to a post-capitalist world. He is also writing a book about the intersection of anarchism and mysticism. He is a Board Member of Greenpeace International USA and a visiting lecturer at New York University, Columbia University and the Ontario College of Art and Design. Alnoor holds an MSc in Philosophy and Public Policy from the London School of Economics.